So you have gotten quite overweight, you want to lose weight, but any look at the mirror tells you its useless? Maybe it’s time to be a little more forgiving to yourself and redirect some of your energy. Years and years ago I heard a song by pop duo Shakespears Sister whose chorus went: “life is a strange thing, when you think you know how to use it, it is gone”. My younger me, in the middle of the teen’s sentimental sadness that we Germans call “Weltschmerz” (literally “world’s hurt”), was struck by this as a fundamental truth. After all, you receive no manual for “Life 1.0” and by the time you have the necessary experiences to make the best out of it, it’s game over. My more mature self today looks at it a little differently. Life, I came to think, is not a scrapbook you’ll file everything away in and only look at once it’s full, it’s a work in progress. It’s more akin to going on a ride and being able to change directions, instead of having to arrive at the original goal no matter what. There are traffic rules that may restrict us and for each and every one of us they might differ a bit, but within them we do have leeway to change direction based on how we liked the journey so far. But I have encountered more than one overweight person that viewed being fat as a substantial part of who they are and felt powerless to do anything about it. The negatives these people subject themselves to in their introspections are often much, much worse than anything they’d ever say to another person: I’m fat and ugly, I’m useless, I’m a slob with zero willpower, I was always fat and I always will be – on and on it goes. What strikes me again and again here is the absoluteness with which they center all the blame on themselves and how they believe that change is completely out of reach. In reality, we are not responsible for all our learned behaviors and we can to learn to redirect energy. Learned behaviors account for many of the things we do in everyday life. You stop at a red light, because you were taught that running over it can have serious consequences. You put on clothes before you go into public, because you were taught that people don’t go outside naked. And overweight parents often have overweight children that later grow into overweight adults because these children learned their eating habits from their parents. 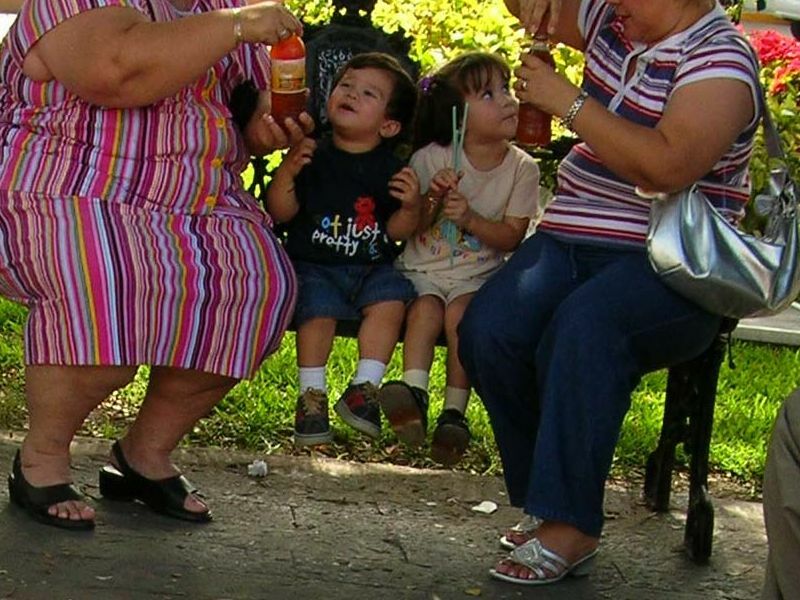 Will these children become as overweight as other family members? Of course, there are overweight people who had parents of normal weight, but still grew to humongous proportions. Many of those quite accidentally discovered that eating has a soothing effect. Eating is a form of self-preservation and self-preservation is deeply embedded in your limbic system, the oldest part of our brains. If you don’t eat, you die and your limbic system makes sure to reward you with positive feelings for behavior that avoids that. This is why most people feel good when they eat. Overweight people often generalized this into a self-soothing mechanism used to combat anything that makes them feel down. Essentially, it is a form of misaligned self-therapy. Taking these into account it is quite clear that you aren’t solely responsible for your weight problem. I have yet to meet a pre-schooler able to discuss healthy eating habits with his parents. And if you started to counter depression by eating then that choice at that point in your life most likely made the most sense. Nobody, literally nobody, I met since I started my own journey into all this said to me, “one day I just decided I wanted to be fat”. Therefore you aren’t really to blame for your weight problems. But neither are your parents or other people who influenced you. The blame game simply has to stop, because blame, no matter who it is directed at, won’t change anything. You can analyze yourself to find out who you are. You can also analyze the past to find out what brought you to where you are right now. But both are only worthwhile hobbies if you use them to make better future choices. There is really only one positive aspect to blame. To assign it, you are required to analyze circumstances and that requires mental energy. It is therefore a question where you now want to direct that energy at: the unchangeable past or the future that can be influenced. You are your past, but you can still decide who you want to be in the future. Pictures courtesy of Angus Fraser and “Gideon“. “You aren’t solely to blame for your weight problem”? Then who is responsible for my fitness level? Our adult bodies are our responsibility. Societal and familial “norms” are not unbreakable and certainly not necessarily good for us. If you were obese and are now fit, you are responsible for your fitness level. Which is what I was driving at: you can change things. Right, agree. I get the credit for being fit, but why shouldn’t I have gotten the blame for being fat? Which I was. That was my doing, too. Yeah, I have metabolic syndrome of which I was unaware for my first 29 years of life, but when I was dx’d with it I fully chose to continue my sedentary lifestyle and unhealthy overeating for the next nine years, well aware of the damage I was wreaking and the risks I was taking with my future. My choice to be inactive and to eat a lot of crap during the first 29 years was no accident, either. You raise a good point, because you did make a choice then. Why did you choose the way you did and continued to live unhealthy for almost a decade? I love the term “weltschmerz!” World sadness to me. When our idealistic view of the world meets reality. I first heard it on the Scripts Spelling Bee when the Canadian girl, my favorite, missed it and finished second. I have always been my hardest critic, but also, on occasion, my biggest supporter. Ich liebe Deutschland, by the way! I have friends in Buchholz that I’ve visited a few times!